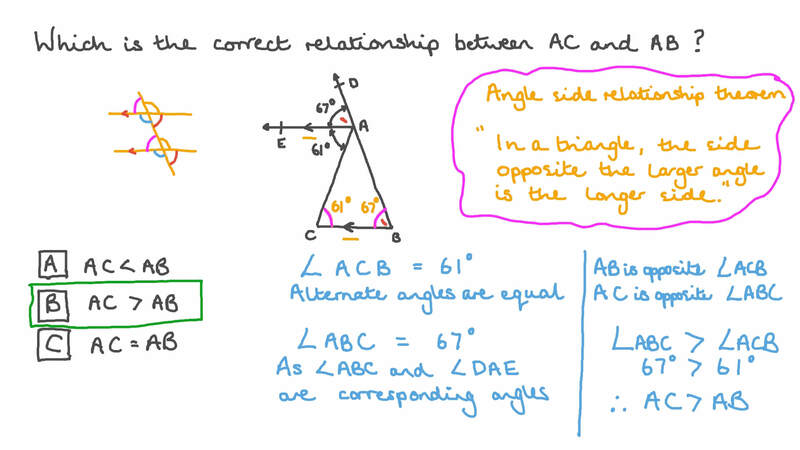 In this lesson, we will learn how to use the angle–side inequality in triangles and more complex figures. Which is the correct relationship between 𝐴 𝐶 and 𝐴 𝐵 ? From the figure below, determine the correct inequality from the following. 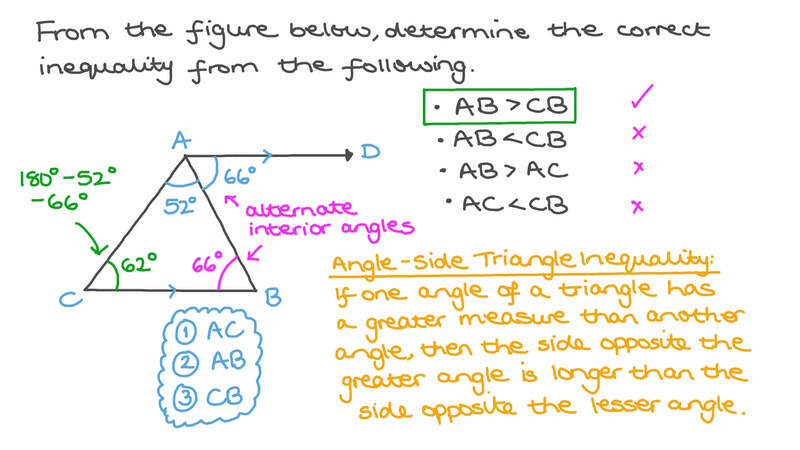 Complete the following using < , = , or > : If, in the triangle 𝐷 𝐸 𝐹 , 𝐷 𝐸 > 𝐸 𝐹 , then 𝑚 ∠ 𝐹 𝑚 ∠ 𝐷 . Given 𝐴 𝐵 = 9 2 c m , 𝐴 𝐶 = 9 1 c m , and 𝐶 𝐸 = 𝐵 𝐷 , choose the correct relationship between 𝑚 ∠ 𝐴 𝐸 𝐷 and 𝑚 ∠ 𝐴 𝐷 𝐸 . Choose the correct relationship between 𝐴 𝐷 and 𝐴 𝐵 . Use < , = , or > to fill in the blank: 𝑚 ∠ 𝐸 𝐷 𝐴 𝑚 ∠ 𝐴 𝐶 𝐵 . Use < , = , or > to fill in the blank: 𝑚 ∠ 𝐴 𝐵 𝐸 𝑚 ∠ 𝐴 𝐶 𝐷 . Use < , = , or > to complete the sentence: If 𝐴 𝐵 𝐶 is a triangle and a point 𝐷 lies outside the triangle, then 𝐴 𝐵 + 𝐴 𝐶 + 𝐵 𝐶 2 ( 𝐷 𝐴 + 𝐷 𝐵 + 𝐷 𝐶 ) . Which inequality is satisfied by this figure? 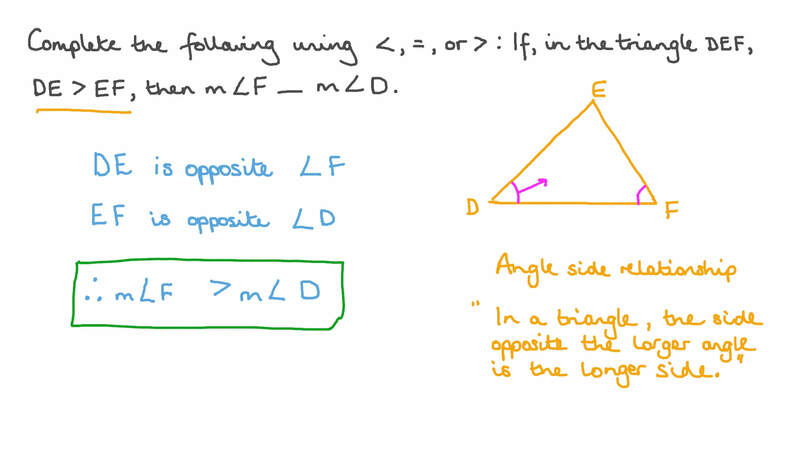 Arrange the side lengths of △ 𝐴 𝐶 𝐷 in descending order. Use < , = , or > to fill in the blank: 𝐴 𝐶 𝐷 𝐵 . List the sides of from shortest to longest. Use < , = , or > to fill in the blank: If 𝑚 ∠ 𝐶 𝐵 𝐷 = 𝑚 ∠ 𝐶 𝐷 𝐵 , then 𝑚 ∠ 𝐴 𝐵 𝐶 𝑚 ∠ 𝐴 𝐷 𝐶 . Use < , = , or > to complete the following: In a triangle 𝐴 𝐵 𝐶 , if 𝐷 is any point on 𝐵 𝐶 , then 𝐵 𝐷 + 𝐷 𝐶 + 2 𝐴 𝐷 𝐴 𝐵 + 𝐴 𝐶 . Use < , = , or > to fill in the blank: If 𝑚 ∠ 𝐴 𝐶 𝐵 > 𝑚 ∠ 𝐴 𝐵 𝐶 , then 𝑚 ∠ 𝐴 𝐵 𝑋 𝑚 ∠ 𝐴 𝐶 𝑌 . Use < , = , or > to fill in the blank: 𝐵 𝐶 𝐴 𝐶 . Use < , = , or > to complete the statement: If 𝐴 𝐵 = 6 2 , 𝐴 𝐶 = 6 3 , and 𝑚 ∠ 𝐴 𝑋 𝑌 = 𝑚 ∠ 𝐴 𝑌 𝑋 , then 𝑌 𝐶 𝑋 𝐵 . Use < , = , or > to complete the following: If 𝐴 𝐸 > 𝐸 𝑋 , then 𝑚 ∠ 𝐶 𝑚 ∠ 𝐷 𝐵 𝐶 . Use < , = , or > to complete the statement: If 𝑚 ∠ 𝐴 𝐶 𝐵 = 6 2 ∘ and 𝑚 ∠ 𝐴 = 5 7 ∘ , then 𝑚 ∠ 𝐴 𝐵 𝐷 𝑚 ∠ 𝐴 𝐶 𝐷 . Is ∠ 𝐴 𝐷 𝐶 < , = , > ∠ 𝐴 𝐶 𝐵 ? Arrange , , , in ascending order according to their lengths. Choose the correct relationship between 𝐴 𝐵 and 𝐴 𝐷 .